Former welterweight world champions Andre Berto and Shawn Porter began fight week activities Wednesday as they hosted a media workout at the famed Gleason’s Gym in Brooklyn in advance of their world title eliminator showdown that headlines SHOWTIME CHAMPIONSHIP BOXING, presented by Premier Boxing Champions, this Saturday, April 22 from Barclays Center, the home of BROOKLYN BOXING™. 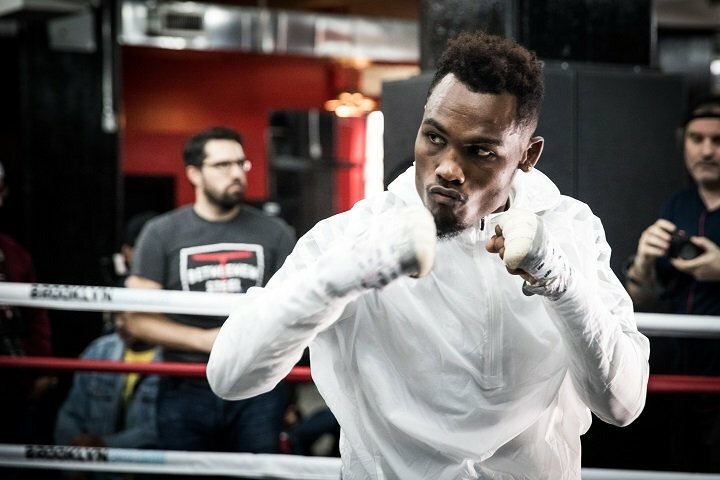 Televised coverage on SHOWTIME begins at 9:30 p.m. ET/6:30 p.m. PT and features super welterweight world champion Jermell Charlo, who was in attendance at Wednesday’s workout,defending his belt against top rated challenger Charles Hatley. SHOWTIME EXTREME action begins at 7:30 p.m. ET/PT as four-time world champion Amanda Serrano looks to become the first female fighter and first Puerto Rican to win titles in five weight classes when she fights Dahiana Santana for a vacant 118-pound title. Rounding out the group of fights participating in Wednesday’s workout were undefeated local prospects Julian Sosa and Richardson Hitchins, who will compete in separate bouts on Saturday night. “This is what we work hard to get to. All the weeks that we put into training camp have been tremendous. As athletes, we spend a lot of time trying to fine tune our craft for a reason. We’re looking to see the harvest on Saturday night. “I really had a tremendous training camp. I tried to stay away from everything else as much as I can. I’m dialed-in right now. “You’re always going to have people with you and against you in this sport. Our job is to work hard and do the best we can in the ring and give the fans a great show. “My focus right now is on this fight night on Saturday. Everything that comes after it will take care of itself. I just have to make sure all my energy is used towards getting this win. “There are a lot of great world champions out in camp with me and we all work hard and feed off of each other. “I’ve been ready waiting for the call for a big fight and this came together and I couldn’t be happier. It’s going to be a great night. “The fans here are real. The energy is always great. There’s so much history in this gym and in this city. It’s always an honor to be a part of it. “We prepared for everything. We’re prepared for 12 rounds. We’re prepared to throw the right punches to slow him down and knock him down. We’re prepared to outbox him or to be aggressive and take the fight to him. “This is a very important fight for me. I’ve watched Berto since the amateurs and on into the pros. I’ve seen him do it all. I’ve seen the best of his career and the worst. I’m going to do what it takes to end up on the right side of this. “People have definitely seen a great deal of my talent in the last fight with Thurman. People know what I can do in the ring but I’m always working on taking it to another level. “I don’t feel pressure to make this an exciting fight. I love that people are looking forward to watching me fight. When I do what I do, people know that it’s going to be exciting. I never have to worry about that part. “I was at the Keith Thurman vs. Danny Garcia and I thought that it could have been me that night. But I’ve reminded myself that my time is coming and this is the first step towards that. “There are some things I have in my arsenal that the world hasn’t seen yet. I’m going to show everyone a little bit more than last time. “I’m ready to go 12 rounds. I’m excited about this fight. I’ve picked up a lot of things in training and I’m ready to shine. “I want to make a statement with a knockout, but if it doesn’t happen, I’m ready to do what I have to do. I can’t put too much pressure on myself, I just have to take care of business. “From growing up in the boxing world, I’ve had to slowly realize how big of a stage I have. I try to help out young fighters on how to get to this point. “Charles Hatley is a good fighter. He comes with pressure and he likes fighting. He’s got a good style and he can bob and weave and be slick. “I’m excited about fighting in Brooklyn for the first time. Everyone knows the fans in New York are great because they’re real and they know their stuff. I’m hoping to give them something to remember. “Training camp went very well. We added a few things to camp based off of the last fight. I felt like there were a few flaws that I needed to correct. We had extra strength and conditioning, more miles on the road and some sparring with more advanced competitors. I can’t wait until fight night. “Having guys like Richardson Hitchins and Jonathan Alonso in the gym with me is great. They’re hungry fighters just like me. It gives me motivation, but we’re also competing. We all want to do better than each other. I love the atmosphere. “My first fight was more than a dream come true. But I’m looking to steal the show every time I’m in the ring. This is going to be another special performance. I’m going to put on a show. “I’ve had a great training camp. I didn’t really take any time off after my last fight. I feel strong. I’m grateful that my team has me busy and I’m ready to keep going. “It feels good to be fighting in front of my hometown fans once again. I love seeing everybody come out and support me. It’s going to be a great fight on Saturday night. Previous boxing news: Mayweather Promotions Set to Appear at 3rd Annual Box Fan Expo, Saturday May 6th at Las Vegas Convention Center! You are here: Home / Boxing News / Berto-Porter & Charlo quotes for Sat.